Amazon Top 100 Best Seller#1 Bestselling Humorous Women's FictionTop 10 Romantic ComedyContemporary Romance best seller "Refreshingly real and wonderfully entertaining with the sexiest lumberjack ever!" ~ Vilma's Book BlogReady to Fall is a standalone friends-to-lovers small town romance.Tall, dark, and handsome is an understatement when it comes to John Day. With rugged good looks, his ever present plaid shirt, and a dog named Babe, John is a modern alpha male lumberjack.After his favorite neighbor rents out her beach cabin for the winter, John finds himself playing tour guide to Diane Watson, a beautiful brunette with her own messy past and recent battle scars.Will he be ready to fall in love? 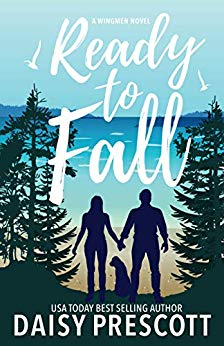 Or will he go back to his old, flirty ways?Hold onto your heart as John Day tells his story in this male POV contemporary adult romance/romantic comedy.Ready to Fall is the first novel in the Wingmen series of standalone, lighthearted small town romances set in the Pacific Northwest. Each book can be read without having read the previous titles.